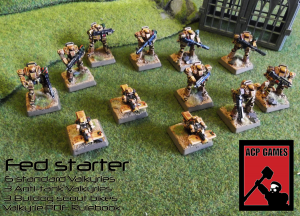 The Federalist Starter gices you a complet company for Valkyrie of 250 points. Loaded with elite troops,if you like special forces this is the starter for you. With two units of Valkyries,and Anti-Tank Valkyrie unit and a scout bulldog unit,it is a must have for elite commanders. This box set also includes the Valkyrie rulebook in PDF format.